Wander through Yosemite’s meadows filled with lush wildflowers whose fragrances will attract pollinators and nature lovers alike on our unique Yosemite Wildflower Tours. Allow them to bedazzle you with their brilliant displays of color while arousing your olfactory senses. 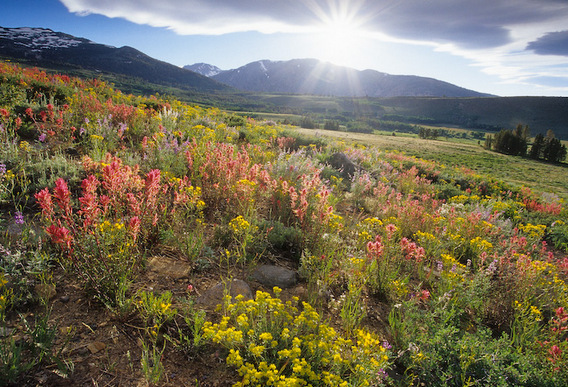 If you are someone who loves looking at wildflowers, we can create a custom wildflower tour to match your needs. Your guide on these remarkable tours will be David Lukas, co-author of “Sierra Nevada Natural History” and a local botany expert with over 20 years experience leading tours in the Sierra Nevada. You may also choose to spend a day in Yosemite with Dan Webster or Pete Devine. Each are also expert naturalists and have been leading groups in the past couple of decades. Our custom wildflower tours fall into two broad categories: Half Day Tours that focus on target wildflower species with long stops at each site, and Transect Tours that will introduce you to a full range of Yosemite habitats with shorter stops at each site. Find some of Yosemite’s many diverse wildflowers with a naturalist on this tour to a region of the park with abundant displays. Tours will last approximately five hours. Spend a day in Yosemite with a naturalist as we transect through the park in search of diverse wildflowers. This car caravan tour will introduce you to a full range of Yosemite wildflowers with shorter stops at each site. Tours will last approximately eight hours. Outings with David Lukas, Dan Webster, and Pete Devine are offered throughout the year. Please call for their availability. All Birding Tours can be made private by adding $125 to the price of the Hike.